I'm tired of stupid comments about religion on Facebook. Radical Christians and radical atheists and generally people of any sort who think that killing in the name of religion is okay bother me. 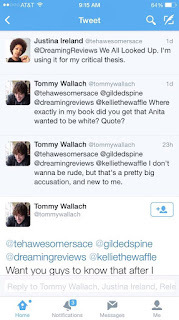 Mainly, though, this post is written in response to Tommy Wallach, a lovely author who has basically says a lot of weird things. 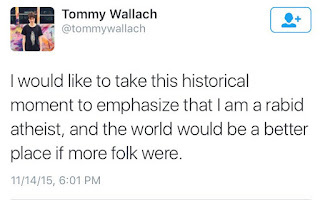 He, being the extremely smart white dude who must always give an opinion on something (I do the same thing, but I digress), tweeted that the world would be a better place if more people weren't religious. Okay, here's the deal: tragedy happens all of the time. Sometimes more people pay attention to it because of who is involved, and sometimes people ignore it because of where it happens. Tragedy is always going to happen. Even if we get rid of religion. That's basically my entire argument right there. I understand (sort of) the knee jerk reaction to say that, without religion, there would be less murders and horrible events happening. But there are just so many things wrong with that. 1) It's such a lazy, general statement: Look, I'm agnostic. I know that religion doesn't do anything for me. I'm guessing that the world would be a better place without radical religion, but that's not what you said. Religion, itself, is a word that includes so many things. There are hundreds of religions (maybe thousands? I don't even know) all over the place. Not everyone murders in the name of religion. Full stop. 2) You're usually talking about one type of religion: Okay, seriously getting deep here. White people usually say this when something happens with Islam, or people who claim to be Muslim, or people they assume to be Muslim. Whenever the KKK comes out and does something painful/disgusting/stupid, I hear people saying that they're horrible and stupid. But no one says that all religion needs to be abolished then. Or, you know, when annoying Christians in the GOP say that gay people shouldn't be able to get married. Or that women shouldn't be able to get abortions. When stuff like that happens, we all get angry and rightfully annoyed and we usually come up with better things to say than "the world would be a better place if you guys were to give up your faith." 3) You ignore the fact that religion works for others: I'm really into learning about my ancestors, and I know that religion helped many of them get through slavery and their generally hard lives. I know that religion helps people grieving for their loved ones. Religion isn't always inherently bad. Just because I can't believe in it, and you don't, doesn't mean that there aren't people who totally feel connected to a deity or several. The fact that you're an atheist doesn't mean that atheism is what will keep the world going round. 4) Atheists have done horrible things: If people are horrible and disgusting, they'll commit horrible and disgusting things, regardless of religion. Stalin killed more than 20, 000, 000 and he had the same idea: he made everyone atheists! By force! And things got so much better in his country! "I’m a feminist. I was raised by a single working mother and she’s still my best friend in the world. If I’m in a room full of dudes for too long, I sorta want to kill myself. When I have a male airline pilot, I get scared. (My mom was the 10th female airline pilot in America, BTW.) I march with feminists under the feminist banner. But this isn’t feminism. This is crass demagoguery, and it cheapens the whole movement it hides behind." I might just be an extremely bitter young girl, because of the racism and sexism and whatnot, but I don't really care if a guy (who does not experience/might not even SEE sexism) feels that women pointing out that Andrew Smith made a sexist comment is a "witch hunt." BH (Black homie): This book is racist. The character isn't well written. Here is why. Tommy: WHAT? *shrieks* HOW DARE YOU CALL ME RACIST. NOPE. NOT HAVING IT. WHAT EVEN MAKES YOU QUALIFIED? 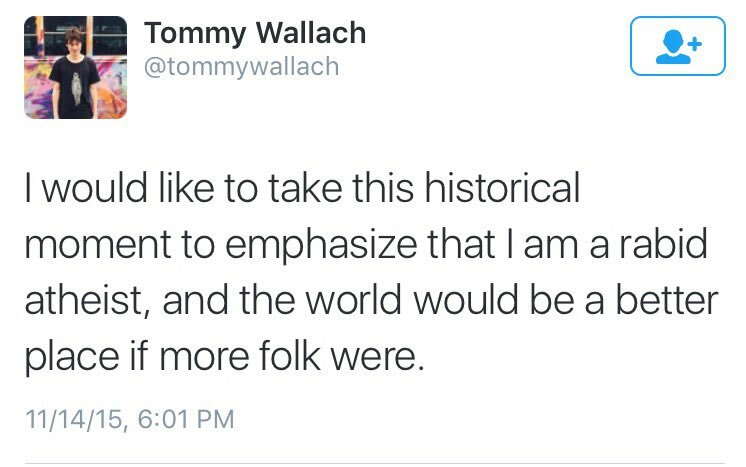 Tommy: GUYS, CAN YOU BELIEVE WHAT SHE SAID ABOUT ME? 3) This: This comment about religion. I honestly get on authors' cases so much because they have such a big impact. They really do, especially those with NYT bestselling books. When you do something, people (especially teens), notice. You know what else they notice? The reaction to what you did. Whether or not you apologize afterward (how you apologize, how long it takes, etc.) If you seem to be learning at all. I have his book under my bed and sometimes I read it and I'm like eh whatever. Your black character bothers me, but who am I to judge? But then I think about the other black girls reading this book, getting excited because there was a black character (like I did), and ultimately feeling let down. That's why I wrote something about this tweet.